Fund for Assistance to the ROCOR - Thank you for the ongoing support of ROCOR Missions around the World! You paid the rent. You provided shelter, food, and water. You made sure the light of Orthodoxy kept shining in the unlikeliest of places. Here are some highlights from 2017. 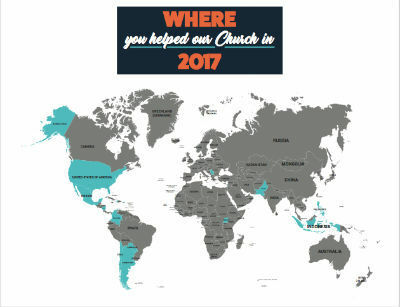 Not only did the mission survive another year and continue to grow; not only did you clothe the naked, feed the poor, and pay for the education of 12 children; because of you, Orthodox Christians in Pakistan could hear Liturgy in their own language! Thanks to you, the first-ever prayer book in Urdu was translated and published by the ROCOR mission in Pakistan. In September 2017, several strong earthquakes hit Mexico. Your generosity allowed Fr Nektariy and the brethren of Holy Trinity Monastery to survive the aftermath and help their neighbors with comfort, psychological counsel, food and blankets. You helped us collect more than enough money for a new van for the orphans at the Bethany School for Girls in Bethany, Palestine. Thank you for allowing the girls to travel safely in this dangerous place! Some said that Fr Boris Galdyshev was insane to become a full-time priest in Buenos Aires without any salary. But you said that he’s a hero. And you allowed him and his family to survive and continue to strengthen their parish. Fr Boris, his family, and his parishioners are deeply grateful for your compassion! Unlike their government and the rest of the outside world, YOU have not abandoned the people of Haiti! And I want to thank you for your compassion! Most people in Haiti, including our brothers and sisters in Christ, are trapped in a vicious cycle of poverty. Many don’t even eat every day! They don’t have money for education, but without it they can’t find a job to lift them out of poverty! Thanks to the generous help of amazing people like you, we have been able to sponsor a week-long seminar that provided rudimentary training in computer science, photography, communication, and even liturgics. These courses provide impoverished Haitians with practical skills that they can then use to support themselves financially. This would have been impossible without your kindness. Thank you!